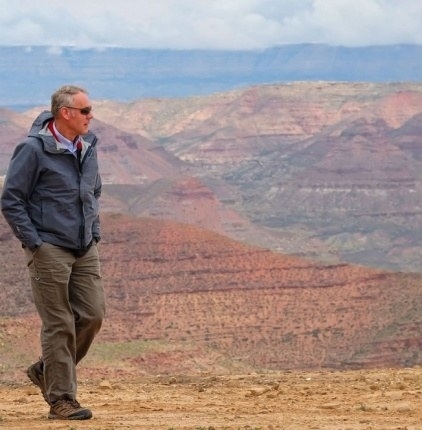 Interior Secretary Ryan Zinke, center, while reviewing a national monument in Utah. The Trump administration is illegally withholding potentially damning information about a sweeping review of America's national monuments, according to a handful of environmental groups who have filed a lawsuit intended to force the release of that information. The lawsuit filed Thursday specifically argues that the Trump administration never responded to multiple Freedom of Information Act requests, or FOIAs, about a review of national monuments that Trump ordered in April. Trump's stated goal of the review was to determine if monuments — which are similar to national parks — were created in the last two decades in accordance with the law. Ryan Zinke, who Trump selected to lead the Department of the Interior, carried out the review, quickly sparking controversy. Conservation groups argued that the White House is attempting to roll back protections for sensitive wild lands, but some western lawmakers and rural communities praised it as a chance to reverse what they described as government overreach. Protesters await Secretary Ryan Zinke in Kanab, Utah, on May 10. The review wrapped up in August, but the Trump administration has released very little information about the process or its findings. The Department of the Interior did produce a page and a half summary, but it didn't mention any monuments by name. The information that has surfaced about changes has come from leaks to news media, or from lawmakers outside Trump's administration. In September, those leaks revealed that Zinke recommended reductions to Bears Ears and Grand Staircase-Escalante national monuments in Utah, Gold Butte in Nevada, and Cascade-Siskiyou in Oregon. Last week, Utah Sen. Orrin Hatch also said Trump told him that the two Utah monuments would be reduced in size. Conservationists were quick to condemn potential changes to the monuments, but neither the Interior Department nor the White House have yet confirmed how significant the reductions might be, of if they'll even happen at all. In response to the ongoing lack of information, an array of environmental groups filed FOIA requests — which legally require the government to respond — for information. When those requests went unanswered, they filed a lawsuit to force its release. The suit was filed by Earthjustice, the Sierra Club, the Natural Resources Defense Council, the Wilderness Society, the Southern Utah Wilderness Alliance, the Grand Canyon Trust, and the Great Old Broads for Wilderness. Secretary Zinke in Utah earlier this year. Exactly what information is included in the requested documents remains unknown, but Chi described the review process as “politically driven” and an “attack on national monuments.” She said that the requested information could shed light on partisan decisions that do not “comport with the Antiquities Act,” which is the law used president's use to create monuments. Other organizations that are part of the suit also slammed the Trump administration's handling of the review and ensuing FOIA requests. In a statement Thursday, Aaron Paul, an attorney with the Grand Canyon Trust, pointed out that the law requires the government to respond to FOIA requests within 20 days. “It’s a shame that we have to turn to the courts to force the secretary to deliver the transparency that the Freedom of Information Act secures for the American public,” Paul added. Bears Ears National Monument, in southern Utah. Chi added that people have a right to information about the monuments. “Common sense dictates that we should have this information because these are decisions about public lands, or lands that belong to the American people,” she said. Thursday's legal action follows another, separate suit filed by the Center for Biological Diversity over unreleased information. When asked about the lawsuit Thursday, the Interior Department referred BuzzFeed News to the Justice Department, which did not immediately respond to requests for comment. Chi expressed optimism that the coalition of environmental groups would prevail in court.